This is an unusual recipe in that it uses the whole orange – skin and all! The recipe requires a stick blender but if you don’t have one, you can still cut up the orange into tiny pieces with a sharp knife. It does take a bit of extra time but it can be done. If the whole cooking an entire orange is not for you – I have found that just cutting up an uncooked orange finely gives a moist and delicious result. You could also just grate the rind off one orange and add the rind and juice of one orange to the mix instead of the whole orange. 1. Preheat oven to 200 C. Lightly grease a 6 cup Texas muffin pan. 2. Cook orange. Place in a pot of boiling water and boil 15 minutes. Take the orange out of the water and place in a pot of boiling water for another 15 minutes. Take out the orange and allow it to cool down. 3. Place flour in a bowl. Stir in baking powder, poppy seeds and sugar. 4. Whisk oil, egg and milk gently in a separate jug. 5. Chop the cooked orange into small pieces and then use a stick blender to chop it up into finer pieces. If you don’t have a stick blender just use a sharp knife to chop the orange into tiny pieces. 6. Stir the oil and milk mixture into the dry mixture and add the chopped up orange to the muffin mixture. Do not over beat or the muffins will be tough. 7. Pour muffin mix into muffin pan and place in 200 C oven for 25 minutes. 8. Remove from oven and allow to sit in the pan for 5 minutes. Remove from pan and place on rack to cool. 9. When cool ice with Cream Cheese Icing. Healthy Hint: Replace 1 cup of plain flour with 1 cup wholemeal flour. 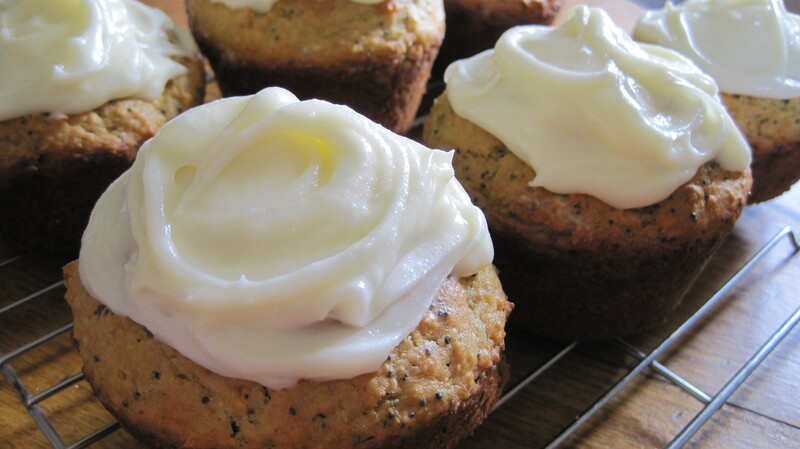 For a lighter muffin, dust with icing sugar instead of making the Cream Cheese Icing.